To make the pesto, combine basil, garlic, pine nuts and Parmesan in the bowl of a food processor; season with salt and pepper, to taste. With the motor running, add olive oil in a slow stream until emulsified; set aside. To cook the Lamb Chops, melt 2 tbsp of the butter and mix with parsley. 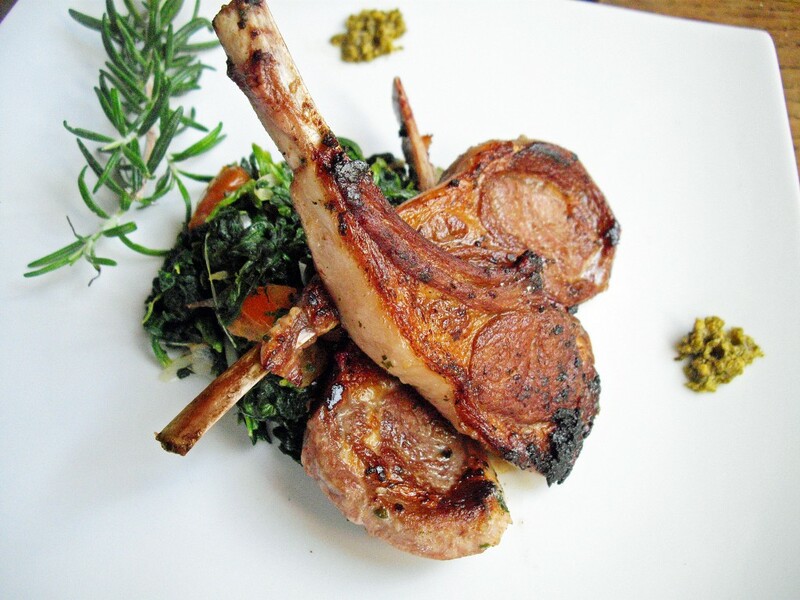 Season the lamb chops with salt and pepper then pour the butter mixture over the chops, turning with a large spoon. Set aside. In the remaining tablespoon of butter, saute the shallots until soft. Add the spinach and saute for 1 minute. Add the diced tomato and continue to saute for another minute. Season with salt, pepper, set aside and keep warm. Saute the lamb chops in a non-stick skillet on a high flame, 2 minutes per side. Serve with the spinach and homemade pesto.